Thousands of people long to be published authors and actors, but in most cases their dreams never come true. However, that was not the case with Bryan Anderson, who lost both legs and his left hand in 2005, while serving in Iraq. The acting parts and book deals fell in his lap without him having to work at it. 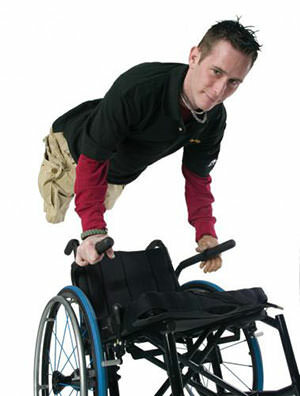 In addition, Anderson is also the national spokesperson for Quantum Rehab, a division of Pride Mobility Product Corporation. The 31-year-old Anderson of Illinois is no doubt leading an extraordinary life, but before he joined the military in 2001, his life was less than ordinary. Prior to enlisting, Anderson worked at American Airlines. “I was going to the same pool hall every day after work with the same friends,” said Anderson. He was bored with his life and needed to do something different, exciting and meaningful, so he joined the military. While Anderson served his second tour of duty in Iraq in 2005, he helped train Iraqis to become police officers. However, on October 23, 2005, his whole life changed after a bomb explosion caused him to lose both legs and his left hand. He was grateful to be alive. “It beats the alternative,” said Anderson, who added that he never for a moment preferred to die. “I was depressed for a few months, while I was recovering at Walter Reed (National Military Medical Center in Bethesda, MD),” said Anderson. Anderson had gone from a war zone straight to Walter Reed. “I forgot what real life was about,” said Anderson. He left Walter Reed for three days and traveled to Las Vegas. “I had a blast. Then I went back to Walter Reed and realized that if I’m having fun and it doesn’t make me think about what happened, or make me care, but just live in the moment, then that’s what I’m going to do.” Las Vegas helped end his depression. Prior to Anderson becoming an amputee he snowboarded and rock climbed, and had no intention of quitting. After he became the national spokesperson for Quantum Rehab, acting agents noticed him. He was in two episodes of the now defunct ABC soap opera, All My Children and he had a small part in the 2008 movie, The Wrestler, starring Mickey Rourke, who portrayed Randy “The Ram” Robinson. In one scene Robinson’s wrestling match spilled out into the crowd. Anderson handed Robinson one of his legs so he could hit his opponent with it. Robinson accepted it. “It was a fun scene,” said Anderson. However when a literary agent approached him two and a half years ago, he finally changed his mind. “I told her,” said Anderson, “that I was tired of people telling me I should write a book. But now I had done some things and had something to say, so I went for it.” He has received positive feedback from readers who told him that they could not put his book down. Besides promoting his book, Anderson has a TV show, Reporting for Service with Bryan Anderson. “It’s about volunteering and doing community service,” said Anderson. 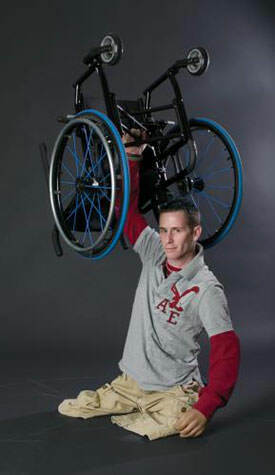 For more information about Bryan Anderson, log onto www.andersonactive.com.